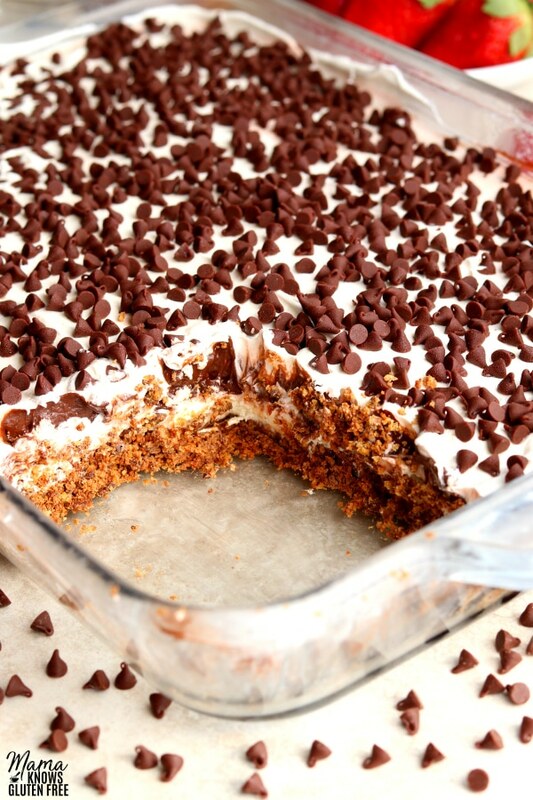 Chocolate Lasagna is an easy no-bake dessert! A gluten-free chocolate cookie crust with layers of cheesecake filling, chocolate pudding, and whipped topping. 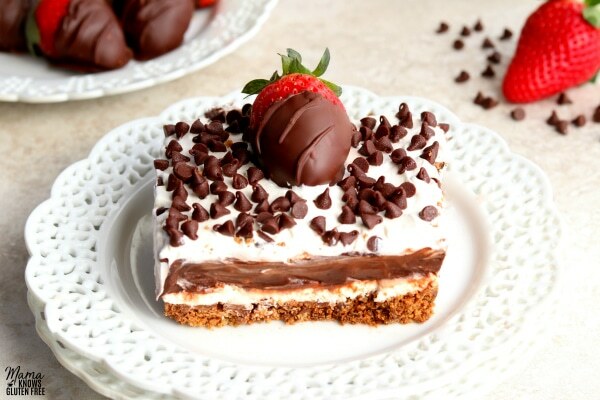 Chocolate Lasagna is an easy no-bake dessert. It’s a layered dessert that is decadent but light. Most people are familiar with Olive Garden Chocolate Lasagna. 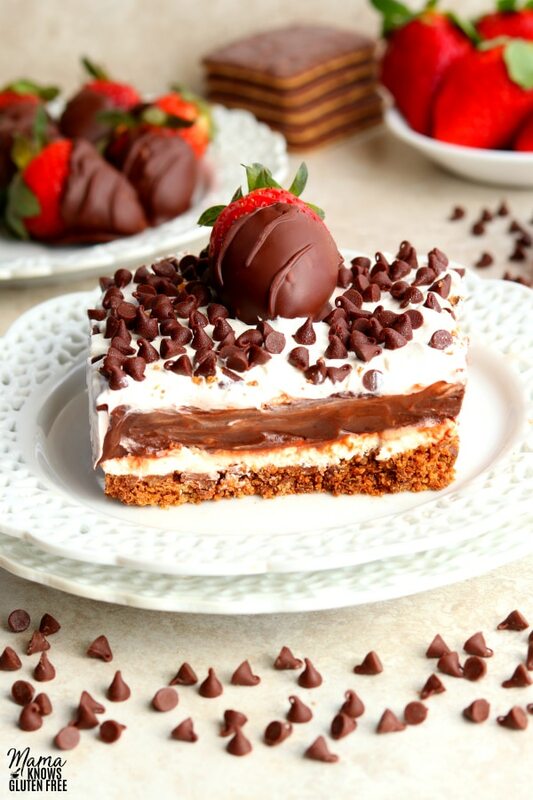 This version of the chocolate lasagna dessert is a little different because I used gluten-free chocolate covered graham crackers, instead of Oreos, for the crust. Spray a 9×13 dish with gluten-free cooking spray. Add the crushed Chocolate Honeygrams to a medium-sized bowl. In a medium-sized bowl, whip the cream cheese with your mixer until fluffy. In a separate bowl, mix the chocolate pudding and cold milk. Mix together until it starts to firm up and looks thick. 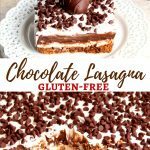 Thank you to Schär for partnering with Mama Knows Gluten Free for this Chocolate Lasagna recipe. For the crust, I used Schär Chocolate Honeygrams. Schär has taken their Honeygrams to the next level by dipping them in dark chocolate on one side! 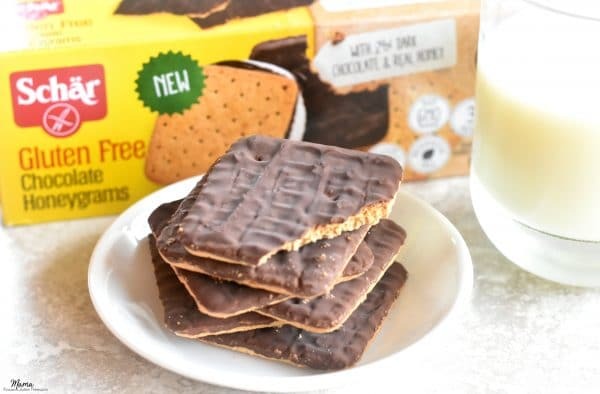 I absolutely love Schär gluten-free items, and they make some of my family’s favorite gluten-free products! They have everything from certified gluten-free bread, to rolls, pizza crust, cookies, crackers, and snacks. This is a super easy no-bake dessert. The chocolate lasagna is made with a few simple ingredients and a few easy steps. It’s also a great gluten-free dessert that can be made ahead of time. You can place the dessert in the freezer and have the dessert ready to serve in an hour. This is a chocolate lovers dream! 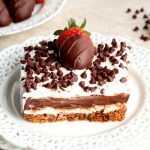 If you love the flavor of chocolate cheesecake you will love this chocolate lasagna made with a chocolate graham cracker crust. 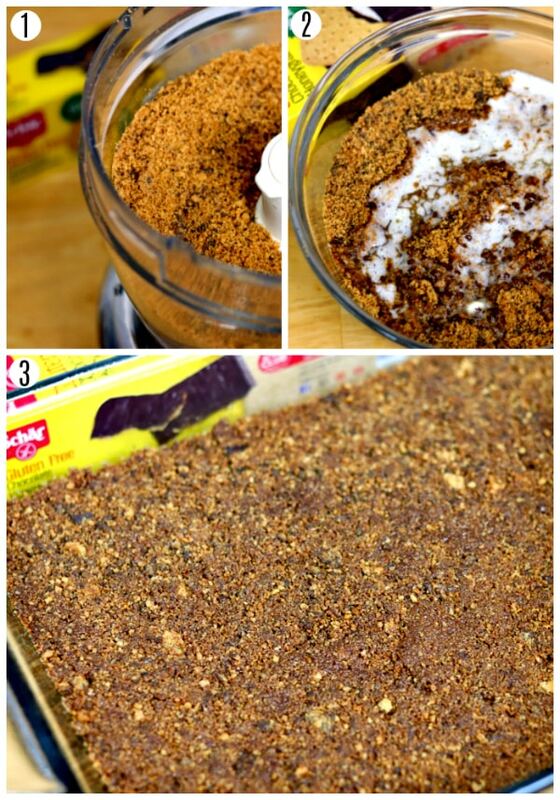 If you have enjoyed the chocolate lasagna from Olive Garden, I think you are going to love the gluten-free graham cracker crust version! More Gluten-Free Desserts To Try! Crush the Chocolate Honeygrams in a food processor or by placing the cookies in a plastic storage bag and crushing them with a rolling pin or your hands. Add the crushed Chocolate Honeygrams to a medium-sized bowl. Pour melted butter over the Chocolate Honeygrams and stir to combine. In a medium sized bowl whip the cream cheese with your mixer until fluffy. Add the granulated sugar, pure vanilla extract and 2 tablespoons of cold milk to the cream cheese and mix until nice and smooth. Stir in 1 cup of the Cool Whip into the cream cheese mixture. In a separate bowl mix the chocolate pudding and cold milk. Mix together until the pudding starts to firm up and looks thick. Spread the chocolate pudding over the top of the cream cheese layer. Place the baking dish back in the refrigerator for another 5-10 minutes to allow the pudding to set. Once the pudding has set, spread the remaining Cool Whip on top of the chocolate pudding layer. Sprinkle the top with the mini chocolate chips, cover with plastic wrap and refrigerate for 3-4 hours before serving. 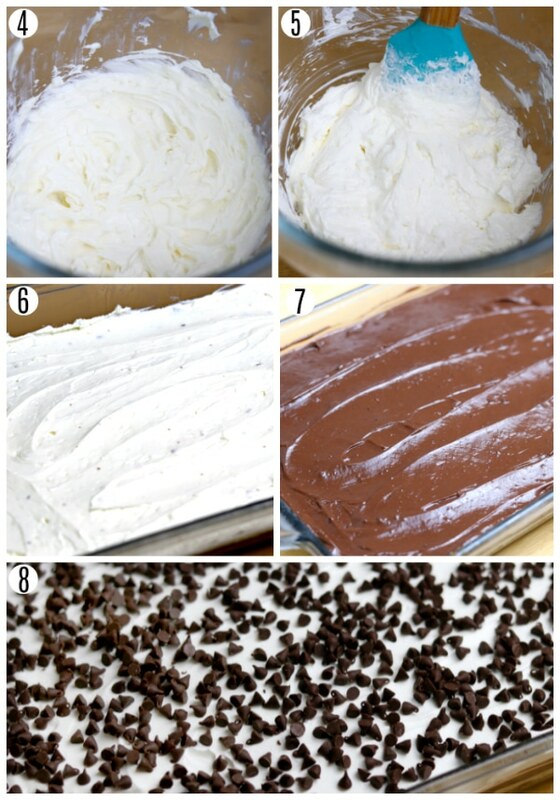 You can speed up the process by freezer the dessert for 1 hour. Enjoy! Has anyone tried either whipped cream? I find Cool Whip kind of gross. Thanks! 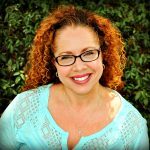 Hi Gretchen! I have not tried making this recipe with whipped cream. If you were going to try it with the whipped cream you may want to stabilize the whipped cream with gelatin. If you decided to try it with whipped cream please let me know how it turns out. Thanks!